Our client had been out with friends at several bars in Manhattan Beach, right near the famous Manhattan Beach Pier. He realized that he had drank a little too much alcohol as the bar he was last at closed for the night. As he was walking back to his parked car with friends, he decided to run over to a dark area in a nearby alley to relieve himself. As he did so, a Manhattan Beach Police Officer turned the corner in his patrol car, his vehicle’s headlights illuminating our client in the act. This took place behind the Kettle Restaurant. Our office has handled perhaps half a dozen cases involving public urination at this exact spot in the alley behind the restaurant. Rarely, however, does the ticket involve an officer driving up on the suspect. Usually, there is a foot officer who issues the ticket. We believe there is an office assigned to this alley at certain times of the year, specifically for issuing public urination tickets. Our client, age 24, was extremely embarrassed and ashamed. The officer was upset with him because the stench of the urine from the area was strong and wafted onto the nearby sidewalk where tourists passed. The area was a “popular peeing area,” as it was near pubic parking and covered in shadows. Our client was issued a ticket on the spot for a misdemeanor violation of Manhattan Beach Municipal Code § 4.102.010, public excretion. He was not arrested or taken to the police station for booking because he signed a promise to appear in the Torrance Superior Court at a later date about eight weeks later. Our client had no prior criminal history and was concerned about losing his job due to being on probation and having a misdemeanor conviction on his record. When he met with Greg Hill, upon retaining Greg Hill & Associates, he described the incident and his concerns. 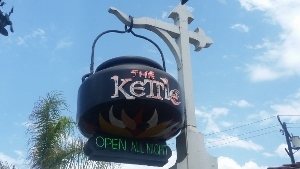 In 50 Words or Less: Manhattan Beach, client caught urinating behind Kettle Restaurant, charged with violating Manhattan Beach Municipal Code Section 4.102.010, a misdemeanor, urinating in public, reduced to infraction. Greg suggested that the client attend ten Alcoholic Anonymous (AA) meetings prior to the arraignment and provided the client with an AA meeting sign-in card, as well as a list of phone numbers and addresses of meetings in the client’s neighborhood. Greg explained that, in the eyes of a prosecutor, defendant looks more unlikely to re-offend if he accepts responsibility for his conduct before going to court and takes steps to reform his behavior, which attending AA meetings suggests. The client then did attend the suggested ten AA meetings and provided Greg the card with the dates of the meetings attended and initials from the AA meeting facilitator. The client also provided Greg his resume to take to court to show the prosecutor, if the prosecutor wanted to know a bit more about the client’s background. At the arraignment, Greg sat down with the Manhattan Beach City Prosecutor (there is no longer such a person – now the Torrance District Attorney handles such cases for Manhattan Beach) and presented her with the AA sign-in card and the resume, suggesting that the prosecutor dismiss the complaint. The prosecutor balked at such a request, but agreed to amend the complaint to allege an infraction for violating Penal Code § 415(2) (“Playing Loud Music”), to which the client could plea and the prosecution would then dismiss the misdemeanor count. The client agreed to the deal, which imposed a $350 fine payable to the City of Manhattan Beach and a $150 fine to the Los Angeles Superior Court. The prosecutor commented that she usually has the defendant also attend twenty AA meetings to “earn” an infraction, but since our client did the ten AA meetings before the arraignment, she would waive that portion of the usual plea bargain. The client was happy with the outcome, as he avoided a criminal record and any form of probation. He also attained closure on the case in a quick manner.